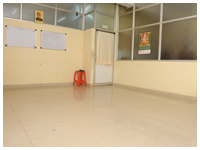 At Sri sadguru chikitsalaya – Ayurlife , we offer both inpatient and outpatient services with modern facilities. We have developed specialized treatment modules on an individual basis. We also have round the clock security, Mini-Library where you can read newspapers, magazines and spiritual books, indoor activity room, wi-fi internet facility and cable television, pharmacy, kitchen, refrigerator and many other facilities at affordable price. 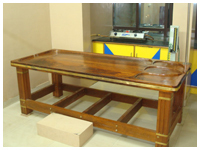 We have aesthetically designed, well equipped and self contained panchakarma theatre. All types of massage therapies from snehana to pindasweda are performed here with experienced staff. All detoxification procedures are also carried out here. 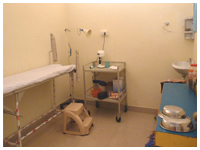 We have one mini-treatment room with full privacy for patients irrespective of male or female. Normally we will perform minor treatments of shorter duration here. The human mind can be ones best friend or worst enemy. Through Yoga and Meditation we can tap our inner potential and calm the mental agitations as well as strengthen our concentration power. With proper yogic postures several diseases can be cured. We have well built and spacious yoga and meditation hall. We provide yogic therapies from our experienced yogic consultant. 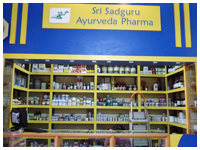 We have well equipped pharmacy, located within the hospital premises with almost all ayurvedic medicines under stock. We have large ayurvedic medicines outlet at our Main Hospital, Vinobanagar and Vidyanagar, Where patient/customer can self pick their medicines based on doctor’s prescriptions. Our Hospital pharmacy at Tilaknagar kept open all 24 hours of day. Sri Sadguru chikitsalaya – ayurlife is a 10 bedded multi speciality hospital with uninterrupted power supply. Here we have 2 special A/c wards with all basic amenities like attached bathroom, 32”LED Television and wi-fi internet. Safe Privacy is provided at the rooms. Each room is provided with intercom telephone facility. 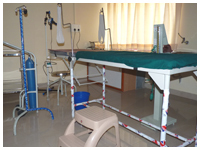 We have 8 bedded general ward with basic facilities like hygiene bathroom & toilet, Television and internet. 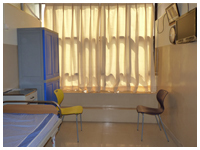 Each and individual bed is covered by curtains so that every patient will get privacy. We have tie-ups with well equipped and modern technological diagnostics labs for finding the cause of health problem accurately and for effective & efficient treatment. Physiotherapy is the treatment of any disease, deformity or malfunction, by distinct therapeutic measures like exercises, heat, light, water etc. and has, over the years, gained vast acceptance as a sophisticated and essential medical technology. An essential aspect of physiotherapy treatment is Rehabilitation. It aims at maximizing the functional potential of an individual. We have experienced physiotherapists to assist and guide patients. 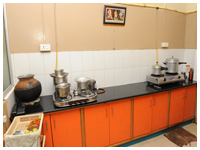 Our hospital has built-in modern, hygiene kitchen with all facilities to cater the food needs of in-patient. Here only vegetarian food will be served as per the prescriptions of doctors. We have our own cloth washing area equipped with fully automatic washing machine. You can wash your clothes on your own. In case, if you prefer to have assistance we will provide a person for washing, drying and ironing of your clothes. © 2013. All Rights Reserved. Sri Sadguru Chiktsalaya. Shivamogga.